"Make Your Space A Green Space Today." 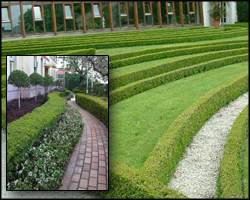 Lawn Service & Landscaping - Commercial & Residential. 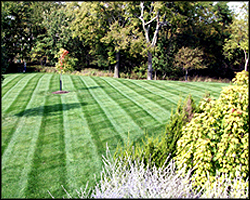 You can count on Green Space Lawn Service for all of your needs. Contact us today to receive a lawn analysis and a FREE quote. Servicing St. Charles County and the St. Louis Metro Area. As you may know, mowing and watering aren't always enough to keep a healthy green lawn. They also need regular fertilization, aeration, weed control and over seeding. These jobs can be tedious and time consuming. Use our experience, expertise and products to help you enjoy your lawn and not just work on it. With a lawn service, your lawn will get just the right amounts of fertilizers and control products at the correct times throughout the year. Why a lawn service? So you don't have to fight the weeds, feed lawn, fill in bare spots, kill lawn-damaging bugs and to keeping your lawn in top shape. If you don't like mowing, we'll do that too. Cutting your grass has many benefits. The first and most obvious reason is because a neat lawn looks much better than an unkempt lawn in the front yard. Cutting your grass is one of the most important steps you can take in caring for the health of your lawn and the appearance of your yard. 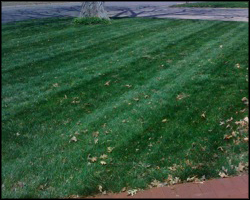 Mowing stripes in your lawn is a good way to make it stand out from other lawns on your block. Cutting your grass also plays an important role in keeping your grass healthy throughout the months of summer. Grass roots don't go very deep into the ground, so the roots can only gather enough water and nutrients to sustain grass at low heights. The correct mowing height varies by type of grass, so make sure you know how high to set your mower for your lawn. Cutting grass to the correct height will help make sure that your grass receives enough water to stay healthy. Cutting grass will benefit the part of the lawn that people see as well as at the biological and chemical level. Get a FREE quote on snow plowing services. Typically, we focus on commercial spaces: parking lots, access from main roads, etc... but, give us a call today to discuss your needs. From large commercial lots to subdivisions and drive ways... no job is too big or too small. We can even supply salt for you to stay ahead of Mother Nature. Let us create a space for you for entertaining or simply a path to your door. Paving brick is available in many colors and styles. We will prepare your site, account for drainage and give you a space to enjoy for years to come. Have you had a tree removed only to now have an unsightly stump in your yard? 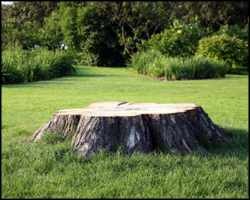 Getting rid of tree stumps can be the most difficult part of tree removal. You can rent a stump grinder or simply give us a call. 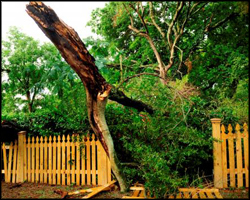 Storms can devastate your landscaping and trees. We offer storm damage clean up of tree limbs, downed trees and damaged landscaping. 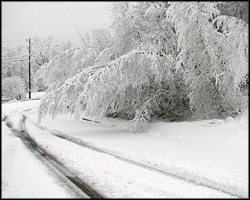 Call us when you have damage caused by rain storms, high winds, snow or ice. Decks, patios, walk ways, edging and more... let us offer suggestions to spice up your space. A path made of stepping stones is a simple, inexpensive way to add charm to your landscape. Garage floor paint can give tired concrete floors an updated look. If you want a low maintenance garden, then sustainable design should be the plan; both for economic and environmental reasons. Natural landscaping with native wildflowers and grasses can attract a variety of birds, butterflies and other animals. A native landscape does not need conventional maintenance like a lawn and is much better for the environment. We'll help you plan for: equipment access, future growth (don't let a planting today get out of control), ease of maintenance and future additions as budgets allow. 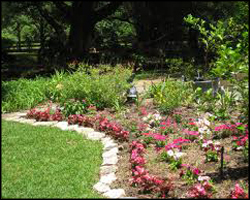 Let us design a custom layout to your flower bed or if you have a design in mind, we will help you make your vision a reality. Flower beds can be used to draw the eye to the front door or a side door that is used as a main entrance, to brighten up an area and improve curb appeal or simply give you those fresh flowers you want to pick every day. 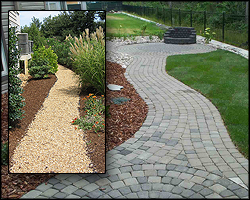 Natural stone and other materials can be used as edging around the border of the flower bed and yard. The possibilities are limitless. Give us a call today to plan around your wants and needs. 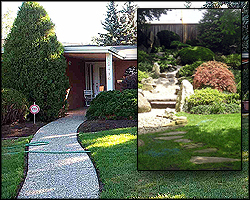 Some of advantages of sodding are: an Instant lawn, fewer Weed Invasions, and fewer erosion problems. When sodding, you should purchase quality sod that has been freshly cut. Using sod that has been grown on a similar type of soil that exists on your current lawn would be best. 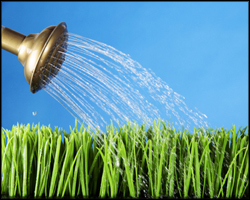 New sod should be watered thoroughly after installation, and then often until the sod is established. Water should go down through the sod to moisten the soil underneath for good root development. 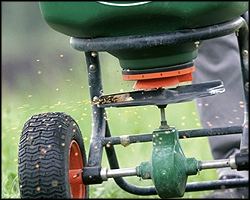 Mow newly sodded lawns on a regularly so that no more than one third of the grass height is removed in a single mowing. A height between two and three inches is recommended. Bushes should be cut back once a year for proper maintenance. Although bushes can be trimmed at any time, there are specific times when cutting is more beneficial; but, prune early enough to harden-off before winter. Some evergreen species need regular trimming to maintain an appealing shape. Trim in early summer when new growth comes in to avoid cutting their terminal buds. Doing so makes them vulnerable to rot and disease. Your soil supplies some of the nutrients that turf grass needs but most soils are not able to provide all of them during the entire growing season. A healthy and actively-growing lawn uses a great deal of energy. Fertilizer helps your lawn stay healthy by promoting root and new leaf growth, help recovery from pests and foot traffic, reduce and control weeds and replacing nutrients that have been lost. Over time, lawns can become compact preventing the absorption nutrients and water. Lawn aeration is the removal of small soil cores (plugs) out of the lawn approximately 4 inches apart and 1-5 inches deep. 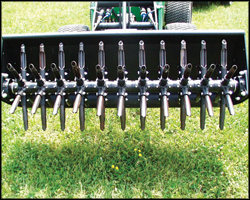 Aeration allows oxygen, nutrients and water to flow more freely to improve root systems and reduce thatch. 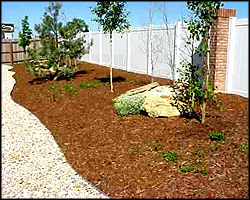 Mulching is an important way to maintain healthy plants. 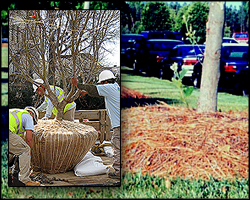 Mulch is applied to the soil surface has many beneficial effects on plants and soil including: prevent loss of water from the soil by evaporation, a reduction in the growth of weeds, keeping the soil cooler in the summer and warmer in the winter, preventing crusting of the soil surface, preventing the trunks of trees and shrubs from damage by lawn equipment and can add to the beauty of the landscape by providing a cover of uniform color and interesting texture to the surface. Leaves can build up in ditches and along curbs blocking drainage resulting in flooding and standing water which may attract mosquitoes. 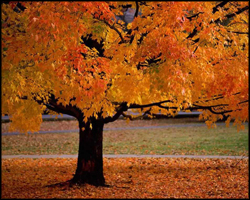 Many communities have leaf removal programs once you get the leaves to the curb or after you spend time bagging them up. Give us a call and skip all the work. 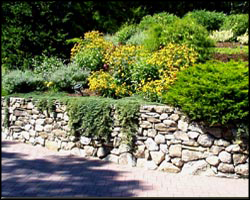 Retaining walls can protect your property from erosion by holding back unstable soil. They can also provide beauty and structure by making level yard space out of previously unusable hillsides. Just like any plants in your yard or home, lawns grow old or week and are prone to damage. 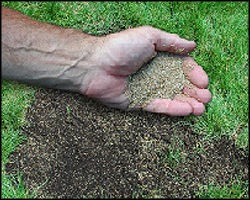 Over seeding helps to keep your lawn healthy by introducing new grass seed; making your lawn lush and green year after year. The sound of water offers serenity that just can't be matched by any other feature in your landscaping. They can also add curb appeal to your yard. We have options of dry features that offer a great visual space, water features with ponds for fish or plants and even pondless waterfalls. 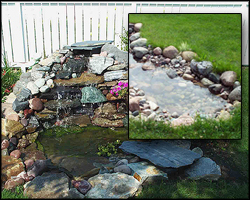 The pondless waterfall is not only easier to maintain, but also eliminates the liability that open water brings. There are low-maintenance features available and if you have a water feature that you no longer wish to maintain, let us convert the space to a pondless waterfall or dry space. Pressure washing is an affordable way to help protect the investment in your home by pressure washing your house, deck, fence, patio and driveway. 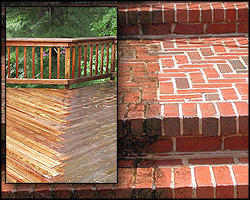 We offer power washing services of: Brick siding, vinyl siding, rock patios, brick and concrete patios and walkways. Composite decks still need cleaning every few years to remove embedded mildew and dirt. Wood can crack and warp when left untreated and unprotected in the harsh outdoor elements. Power washing and treating fences, decks and lawn furniture can extend its life and remove mold and mildew making it look like new.